← Tuition : A Necessary Evil????? 2. 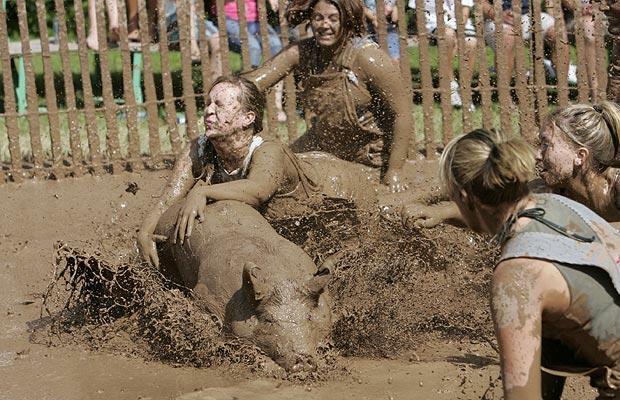 Be sure you have right clothes on (attitude etc), before indulging in muddy pig wrestling. Ensure you have plenty of time to have a good shower, a laugh at yourself, and a warm-down after. 3. Don’t be surprised if the muddy pig get’s you muddy. Or they squeal, or play dirty, or run around in circles, small and large, tirelessly. 4. When the pig taunts you to come back for more mud wrestling – (they will) – make sure it is you that decides whether to ‘go back for more’ – not the pig. 5. Above all, remember that, in reality, generally speaking, pigs are amazingly lovely intelligent loveable creatures! So at least be the same! Be the best you can be. 6. Be kind! Be kind and gentle. Otherwise ‘the audience’ will judge you not the pig. They already feel sorry for the pig, before you start. So enter the ring with caution – if atall. And they are, after all, just muddy pigs. We and they are, after all, brothers and sisters, everything is interconnected, we are all part of each others journey, and we all have something to learn from each other. Unless we deny ourselves that possibility, and *deny* that pleasure! …………………don’t bother about getting dirty….